The night after Halloween, I drive home from town to my cabin in the bush. The rain-streaked road winds past orchards and vineyards, then lopes uphill into sagebrush and pine. Across the lake, the knuckled peak of Giant’s Head spooks a sliver of new moon. A witch straddles the power line. I pull onto the shoulder and cut the car lights. A dark form hangs in mid-air, squat and stolid, back-dropped by the silver sheen of Okanagan Lake. I grapple for my flashlight. A great horned owl rotates its head towards me, golden black-cat eyes scanning the landscape. Then its wings extend and the owl swoops into the night, navigating a sea of darkness. It disappears against the pinpricked lights across the lake. I haven’t seen a great horned owl for years. I moved to the Okanagan valley forty-five years ago, entranced by its biodiversity. Canyon wrens, blue-tailed skink, rattlesnakes, rubber boas and badgers made this place home. A great horned owl used to roost on the old pine snag outside the house. It hooted through the night: Whoot, who, whoo hooooot. Whoooot, whooo, whooot. A woodwind sound—mournful as the wail of the Kettle Valley Railway on its run from Penticton to Midway. The last train went through in 1973. I don’t hear many great horned owls these days. Back at the cabin, I check my field guides. The range of the Northern Great Horned Owl, Bubo virginianus, extends throughout western North America, but I know little more aboutthis bird. Great horned owls are nocturnal, but may be visible during the day, especially when mobbed and harassed by crows and smaller birds. At the top of the food chain, they consume a variety of smaller mammals including hares, weasels, marmots and birds. A great horned owl can hear or spot a rodent under snow. With a wingspan of almost three feet, it can swoop down on a meadow vole. The owl is a stealth machine. The next morning, I drive back to town through ponderosa pine and golden cottonwoods. As I near the old dump, close to yesterday’s sighting of the owl, a grey-brown object is clumped on the road ahead. It’s too small for a deer, but large enough to be visible from a distance. Trick or treat? Two ravens prance stiff-legged on top, pecking at the lumpy mess. As I slow down, the object morphs into an accident of feathers. A brown-striped tail juts from beneath a mishmash of grey and brown. The ravens hop from a perch of torn red flesh that glares like a police siren. Perhaps it’s a red-tailed hawk or some other large bird. I can’t bring myself to stop. Could this be the owl I saw last night? I know that owls often feed on mice and voles on the road shoulder. 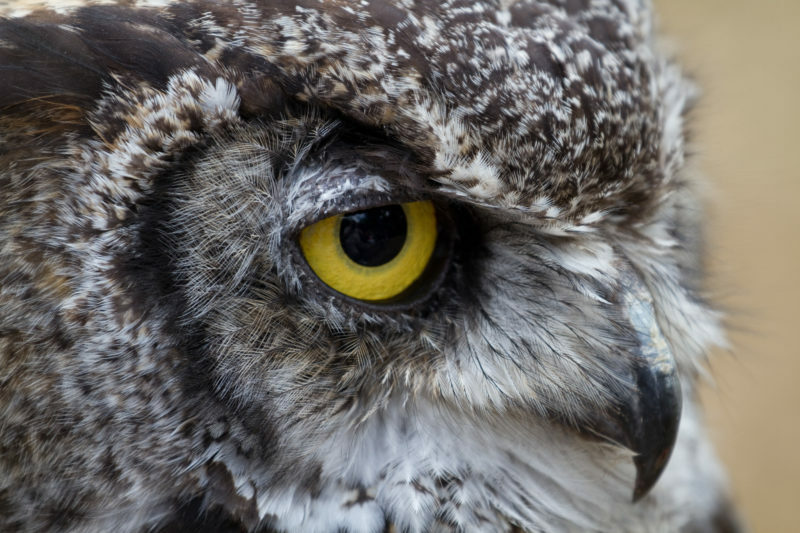 Although great horned owls may live longer than a quarter of a century, mortality rates are particularly high in young owls. This could be a juvenile. That afternoon when I return, the dead bird has been pulled to the side of the road. Hours ago, this mishmash was a lineman of a bird. Now it lies twisted and pulled apart, one wing raked askew. Bloodstained vertebrae hook like a question mark. I cannot locate the head. This may be a great owl, but it is no longer horned. The corpse is feathered — primaries and secondaries, coverts, contours and semi-plumes, down and tail feathers. Marbled birds-eyes, like a Gustav Klimt painting, and stripes of brown, taupe and grey. These provide camouflage and warmth; they enable owls to glide silently and swiftly to their prey from an aerial perch. Two limp and furry rabbit-like feet poke below, unlucky charms. When I get home, I call my friend Tony, an avid birder and former parks interpreter. I sit in my favorite chair, looking over the lake into a bowl of overcast sky. It’s not just the transience of beauty or the imminence of death. I am struck that someone may have killed it intentionally. Surely, to see this owl in flight, followed so soon by a grisly death is more than coincidence. I am a witness to something extraordinary; I have a responsibility. The next day, I leave the house early, red long-handled clippers in hand. The owl is now reduced to a flimsy architecture of quill and bone. From a flimsy wig of gray-brown plumage, the crimson core glares, reduced to half its former size. Only the tail remains intact. Zygodactyl feet, capable of seizing small mammals, hang limp and long, like two stuffed toys. At the bottom of each toe are tiny claws, talons that could rake the flesh of an elephant. This cannot be the bird on the wire. I approach the body with a detachment that is not exactly clinical. The corpse is so mangled that I don’t know where to start. One of the wings folds in on itself like a reticulated fan. The other is torn; primaries stagger in clumps. I make a poor pathologist. Checking for traffic, I hold the carcass over the ditch. The clippers gnaw at the joint. I recall the Thanksgiving turkey in its cellophane package, a grey mound of pimpled flesh, already plucked and plumped, bearing little resemblance to a living creature. This bird is dressed for flight. Beneath my breath, I offer an apology. I acknowledge my species’ complicity for avian assault (on behalf of Henry Ford, General Motors and highways everywhere). Even if the death of the owl is an accident, it represents the collateral damage of human encroachment of wild space. Repentance cuts no truck. The bird will not acquiesce. It practices passive resistance, resilient in its death. The clippers cannot cut through the tendon. The fleshy fabric will not release the wing. Then I hear the slip of release, and in one feral act, tear wing from body. From my fingers, the wing stretches to the ground, feathers extended. I wrap it in a Save-on-Foods shopping bag and twist the top to keep it out of sight. Picking up the remainder of the corpse with my other hand, I carry it uphill and place it on a rocky roost overlooking the lake. I’m nauseous when I get back to the cabin. What prompted me to cut this wing? Why did I bring it home? Out on the porch, the wing swings in its bag, long and narrow like a torpedo. I phone my sister Polly, a wildlife biologist. Late that afternoon, I look out on the porch, where the bag hangs from the beam, shuffling in the afternoon breeze. I inhale. All of this is to expiate my guilt, a testimony to human desire. Yes, I reside at the ‘bunchgrass/forest interface’ so that I can readily view and experience its biodiversity. But my presence is not benign. I drive to town almost every day. I too might have hit this owl on the road, although not intentionally. I inhabit a place that until the last century was relatively ‘wild,’ and my life here impacts others as well. To display the wing in my home does not serve the interest of the owl, science, or art. Clipping the wing from the body is the appropriation of another life form. To dismember the bird is to carve it from its essence. Night comes early as I drive down the road and pick my way uphill, through sagebrush and pine, to the rocky overlook. To the west, Okanagan Lake is lit by a scimitar moon. The remains of the great horned owl form a small bony cathedral, its remaining flesh nibbled close. The wing slides from the bag onto the lichened granite. As I turn to go, feathers lift in the evening breeze. Melody Hessing teaches Environmental Sociology in B.C. colleges and universities, exploring the relations between society and the natural world. In addition to scholarly publications, her creative non-fiction has been published in several literary magazines and anthologies. Her writing explores the intersection between society and nature not only to celebrate the wild, but to lament its demise.